Quebec City or Québec (French: Ville de Québec) is the capital of the Canadian province of Quebec and one of the oldest cities in North America. The city has a population of approximately half a million. Quebec City is known for its Winter Carnival and the Château Frontenac, a historic hotel that dominates the city skyline. It is the second largest city in the province, after Montreal. Quebec's Old Town (Vieux-Québec), the only North American fortified city north of Mexico whose walls still exist, and was declared a World Heritage Site by the United Nations Educational, Scientific and Cultural Organization (UNESCO) in 1985. Quebec City is a popular tourist destination known for its "European" charm, culinary flavors, Winter Carnival, and Saint-Jean-Baptiste Day celebrations. Traditional representation of Samuel de Champlain. Quebec City is one of the oldest settlements in North America. It is named after the Algonquin Kébec, meaning "where the river narrows." The French explorer Jacques Cartier (1491-1557) built a fort at the site in 1535, where he stayed for the winter before returning to France the following year. He came back to the fort in 1541 with the goal of building a permanent settlement. However, this first settlement was abandoned in the summer 1542, due to the hostility of the natives combined with the harsh living conditions of winter. Quebec was formally founded by Samuel de Champlain (1567-1635) on July 3, 1608 at the site of a long-abandoned Saint Lawrence Iroquoian settlement called Stadacona. Some other towns were founded before, most famously Tadoussac in 1604 which still exists today, but Quebec was the first to be meant as a permanent settlement and not a simple trade post. Over time, it became the capital of French Canada and all of New France. The first version of the town was a single large walled building, called the Habitation. This arrangement was made for protection against perceived threats from the indigenous people. The difficulty of supplying the city from France and the lack of knowledge of the area meant that life was hard. A significant fraction of the population died of hunger and diseases during the first winter. However, agriculture soon expanded and a continuous flow of immigrants, mostly men in search of adventure, increased the population. Between 1663 and 1673, orphaned girls from France, known as Filles du roi emigrated and restored the balance of population, helping to stabilize the population and fix the people to their lands. Down the Saint Lawrence River, the next two towns to be founded were Trois-Rivières in 1634 and Montreal in 1642. France, in company with other European countries in the sixteenth and seventeenth centuries, looked upon colonies as sources of wealth to be exploited for the benefit of the homeland. It was felt that the best means of administrating and exploiting the new colonies was through chartered companies which were granted monopolies to open up trade in the new lands. Before 1627, a wide variety of companies had held this monopoly and had exercised virtually absolute powers of government. The Roman Catholic Church would be given en seigneurie large and valuable tracts of land estimated at nearly 30 percent of all the lands granted by the French Crown in New France. In 1627, after meeting with Samuel de Champlain, Cardinal Richelieu granted a charter to the Compagnie des Cent-Associés (or Company of One Hundred Associates). This gave the company control over the booming fur trade and land rights across the territory in exchange for the company supporting and expanding settlement in New France (at the time encompassing Acadia, Quebec, Newfoundland, and Louisiana). Specific clauses in the charter included a requirement to bring 4,000 settlers into New France over the next 15 years. The company largely ignored the settlement requirements of their charter and focused on the lucrative fur trade, only 300 settlers arriving before 1640. The early years of their rule were disastrous for Quebec. The first two convoys of ships and settlers bound for the colony were waylaid near Gaspé by British privateers under the command of three French Huguenot brothers, David, Louis and Thomas Kirke. Quebec was effectively cut off. On July 19, 1629, with Quebec completely out of supplies and no hope of relief, de Champlain surrendered Quebec to the Kirkes without a fight. De Champlain was taken to England as a prisoner of war and released in 1632. In 1632, under the Treaty of Saint-Germain-en-Laye, Quebec and all other former French possessions in North America were returned to New France. 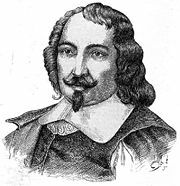 De Champlain was restored as governor but died three years later. On the verge of bankruptcy, the company lost its fur trade monopoly in 1641 and was finally dissolved in 1662. The establishment of the Conseil souverain, political restructuring which turned New France into a province of France, ended the period of company rule and marked a new beginning in the colonization effort. In the middle of the eighteenth century, the British North America had grown to be close to a full-fledged independent country, something they would actually become a few decades later, with more than one million inhabitants. Meanwhile New France was still seen mostly as a cheap source of natural resources for the metropolis, and had only 60,000 inhabitants. Nevertheless, New France was territorially larger than New England. When the Seven Years' war started, it was an obvious and easy target for the English. The first battles were fought inland, in present day Upstate New York. However the French could still retain the advantage in this region due to rough terrains, already built fortresses and alliances with local native tribes. The battle of Fort Carillon (now known as Fort Ticonderoga) is well known as one of the few French victories of the time. The present-day flag of Quebec is based on the flag carried by the militia at this battle. Now in possession of the main city and capital, and further isolating the inner cities of Trois-Rivières and Montreal from France, the rest of the campaign was only a matter of slowly taking control of the land. The last battle was fought in Montreal in 1760. Following the capitulation of the government of New France in Montreal on September 8, 1760, Canada was put under British military rule headed by General Jeffery Amherst as Governor General of British North America. Amherst retained the three administrative districts of New France—Quebec City, Trois-Rivières, and Montreal—appointing a lieutenant governor for each, respectively, Generals James Murray, Ralph Burton, and Thomas Gage. The military regime ended with the appointment of Murray as first British civilian governor, and Burton as brigadier, or military commander, of the new Province of Quebec a few months after the signing of the Peace Treaty of Paris on February 10, 1763. The treaty contained a Royal French renunciation of their claim to Quebec in exchange for the right to retain possession of Guadaloupe. Issued on October 7, 1763, the British Royal Proclamation of 1763 laid out the policy of Great Britain regarding its newly acquired colonies of America. The three Quebec districts were united into the Province of Quebec. Part of the Quebec Act of 1774 gave French Canadians continued use of their French civil law and recognized the Roman Catholic Church with the continuation of its right to legally collect tithes. The boundaries of Quebec were expanded to include the Ohio Country and Illinois Country, from the Appalachian Mountains on the east, south to the Ohio River, west to the Mississippi River and north to the southern boundary of lands owned by the Hudson's Bay Company, or Rupert's Land. Quebec City was captured by the British in 1759 and held until 1763. Quebec was the site of the Battle of the Plains of Abraham during the Seven Years' War, in which British troops under General James Wolfe defeated the French general Louis-Joseph de Montcalm and took the city. France later ceded New France to Britain. At the end of French rule in 1763, the territory of present-day Quebec City was a world of contrasts. Forests, villages, fields and pastures surrounded the town of 8,000 inhabitants. The town distinguished itself by its monumental architecture, fortifications, muddy and filthy streets, affluent homes of masonry and shacks in the suburbs Saint-Jean and Saint-Roch. Despite its urbanity and its status as capital, Quebec City remained a small colonial city with close ties to its rural surroundings. Nearby inhabitants traded their farm surpluses and firewood for imported goods from France at the two city markets. During the American Revolution, revolutionary troops from the southern colonies assaulted the British garrison in a futile attempt to liberate Quebec City now known as the Battle of Quebec. The defeat of the revolutionaries from the south put an end to the hopes that the peoples of Quebec would rise and join the Revolution. Major General Isaac Brock fortified Quebec City by strengthening the walls and building an elevated artillery battery before the War of 1812. In World War II, two conferences were held in Quebec City. The first one was held in 1943 with Franklin Delano Roosevelt (the United States' president), Winston Churchill (the United Kingdom's prime minister), William Lyon Mackenzie King (Canada's prime minister) and T.V. Soong (China's minister of foreign affairs). The second one was held in 1944, and was attended by Churchill and Roosevelt. They took place in the buildings of the Citadelle and of nearby Château Frontenac. A large part of the D-Day Landings plans were made during those meetings. According to the 2006 census, there were approximately 720,000 people residing in Quebec City, and the vast majority of its inhabitants were French-speakers. In the five years between 1996 and 2001, the population of Quebec City grew by 1.6 percent, compared with an increase of 1.4 percent for the province of Quebec as a whole. Population density of Quebec City averaged 216.4 people per square kilometre, compared with an average of 5.3, for the province of Quebec as a whole. According to the 2001 census, over 90 percent of the population was Roman Catholic, along with small Jewish and Protestant populations. In mid-2001, 13.0 percent of the resident population in Quebec City was of retirement age (65 and over for males and females) compared with 13.2 percent in Canada. The average age is 39.5 years of age compared to 37.6 years of age for Canada as a whole. The Province of Quebec has a modern post-industrial economy with a positive trade balance. Since the signing of the free trade agreement between Canada and the United States in 1987, along with the rest of Canada, Quebec exports to the American market have increased substantially in most sectors. The 2005 GDP was $221.6 billion (purchasing power parity) making it the 38th biggest economy in the world. In 2005, the Province of Quebec had a GDP per capita of $29,163 (PPP). In 2002, it imported $83,363 billion of goods and services and exported US $92.195 billion. Approximately 81 percent of all Quebec exports go to the United States. Satellite image: Quebec City on the north bank of the Saint Lawrence river, Lévis on the south bank, and the western point of the Île d'Orléans. Quebec City is served by Jean Lesage International Airport, located in the West of the city. The city also has a large major port on the Saint-Lawrence River. Three bridges, the Quebec Bridge and Pierre Laporte Bridge connect the city with the south shore of the Saint Lawrence River, as does a ferry service to Lévis, and Orleans Island Bridge connects Quebec City with the Orleans Island. The city is a major hub in the Quebec provincial road network, fanning out from both sides of the river with an extensive autoroute system. Several important motorways of the Quebec road network pass by Quebec City, of which Autoroute 40 connects it towards the west to Montreal and Route 175 connects it towards the north to Chicoutimi. Three principal expressways cross the agglomeration from the north to the south (starting from the west): Autoroute Henri-IV, Autoroute Robert-Bourassa, and Autoroute Laurentienne. Three other motorways cross the western part of town (from north to south): Autoroute Félix Leclerc (known by the inhabitants as "Autoroute de la Capitale"), Autoroute Charest, as well as Champlain Boulevard, which goes along the river to the Downtown area, then another Autoroute called Dufferin-Montmorency allows easier access to the extreme east of the city. The city is served by VIA Rail (Gare du Palais), and is the eastern terminus of the railway's main Quebec City-Windsor Corridor. The bus station, with connections to the provincial long-distance bus network, is also in the same location. The Réseau de transport de la Capitale is responsible for public transportation by bus. An overdependence on autos leaves little room for cyclists on the roads. They are generally forced into autos as in most American cities, detracting from the European character of the city. Château Frontenac, Haute-Ville (Upper Town). Notre Dame des Victoires church, Basse-Ville (Lower Town). Many of the city's attractions are east of the fortification walls in Vieux-Québec (Old Quebec). This area has a distinct European feel unique in North America with its stone buildings and winding streets lined with shops and restaurants. Porte Saint-Louis (Saint Louis Gate) and Porte Saint-Jean (Saint Jean Gate) are the main gates through the walls from the modern section of downtown. West of the walls are the Colline-Parlementaire (Parliament Hill) district and the Plaines d'Abraham (Plains of Abraham). 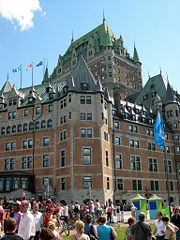 Quebec City's skyline is dominated by the massive Château Frontenac Hotel, perched on top of Cap-Diamant. 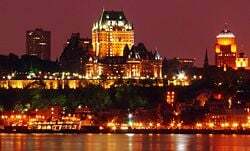 The hotel is beside the Terrasse Dufferin (Dufferin Terrace), a walkway along the edge of the cliff, offering beautiful views of the Saint Lawrence River. The Terrasse Dufferin leads toward the nearby Plains of Abraham, site of the battle in which the British took Quebec from France, and the Citadelle of Quebec, a Canadian Forces installation and the federal vice-regal secondary residence. The National Assembly, Quebec's provincial legislature, is also near the Citadelle. The Haute-Ville (Upper Town) is linked to the Basse-Ville (Lower Town), which includes such sites as the ancient Notre Dame des Victoires church, the historic Petit Champlain district, the port, and the Musée de la Civilisation (Museum of Civilization). Université Laval is located in the western end of the city, in the borough of Sainte-Foy. However, the school of architecture of Université Laval is located in Old Quebec. The central campus of the Université du Québec is also located in Quebec City. Tourist attractions located near Quebec City include Montmorency Falls and the Basilica of Sainte-Anne-de-Beaupré. Campus of the "Maison des métiers d'art de Québec"
↑ Statistics Canada, Population and dwelling counts, for Canada and census subdivisions (municipalities), 2011 and 2006 censuses. Retrieved May 24, 2012. ↑ Statistics Canada, Population and dwelling counts, for census metropolitan areas and census agglomerations, 2011 and 2006 censuses Retrieved May 24, 2012. ↑ Roy Dalton. The Jesuit Estates Question 1760-88 (University of Toronto Press, 1968), 60. ↑ In 1840, after the Province of Canada was formed, the capital was shared between Kingston, Montreal, Toronto, Ottawa and Quebec City (from 1852 to 1856 and from 1859 to 1866). ↑ In 1867, Ottawa (which was chosen to be the permanent capital of the Province of Canada) was chosen to be the capital of the Dominion of Canada. Dalton, Roy. The Jesuit Estates Question, 1760-88. (University of Toronto Press, 1968. This page was last modified on 19 June 2015, at 14:39.